Last week Padraig Harrington was selected as Europe’s team captain for the 2020 Ryder Cup matches, edging Englishman Lee Westwood and Spain’s Sergio Garcia for the honour. Is Paddy the right pick and what will he bring to the role? Jim Deeks, Fairways Magazine (@jimdeeks): I’ve always had the sense that Paddy may have more of an edge than most of us might know. This may be a good thing, or it may turn the players against him if he tries to be too much of a teacher or task-master. It might’ve been better to pick Paddy for a team that was coming off a loss, not a win, and needing a mild-mannered coach who carries a big stick. On the other hand, I’m getting way too analytical here. I’m sure he’ll be fine. Although I’m sure Westwood and Sergio (especially) are ticked. Craig Loughry, Golf Ontario (@craigloughry): Paddy will make a good captain. He’s well liked by many of the players, and he’s a straight shooter. And that may be the only issue with him, he is opinionated and not afraid to express himself, for his own sake and the team I hope the filter goes on and he doesn’t have any spats in public (needs to keep things about his team within the team). It will be a fun ride watching this for the next 18 months. Michael Schurman, Master Professional / Life Member, PGA of Canada: It was a ‘toss-up’ between Padraig and Westwood. Sergio is still an active payer who could make the team and will certainly get his chance. Since the appointment has become so much honour/achievement oriented you have to go with Padraig’s 3 majors. Any one of the 3 will be a good Captain! Dave Kaplan, Freelance Writer (@davykap): I think it’s a good pick, although I’m still waiting for the Miguel Angel Jimenez led squad (fingers crossed for 2022!). Paddy is kind of everything you want in a captain: he’s only 47, is beloved by the players, is a meticulous strategist, has considerable Ryder Cup experience and never shies away from the media. I think the Euro players are really going to enjoy playing for him. TJ Rule, Golf Away Tours (@GolfAwayTJ): Perfect, err, choice, err, for Captain for the, err, Euros in 2020! I like this choice, he’s a well-liked guy and likely won’t contend to make the team like Garcia and possibly Westwood could do. And he’s been vice captain in the last two contests, so he has the experience to become the head honcho. He should maintain the great camaraderie for the team that has been the main reason for their immense success over the past 20 years. Hal Quinn, Freelance Writer, Vancouver: One thing for sure, the interviews and press conferences are going to be loooong. The Dubliner can rattle on. He’s popular among the lads, has a great sense of humour (heck, he’s Irish!) but he’s hyper analytical and worries things to death (like his swing), and yaks endlessly. All that isn’t going to translate into leadership. He deserves the captaincy on his playing record, but not his quirks. Hope I’m wrong. Peter Mumford, Fairways Magazine (@FairwaysMag): Paddy will be awesome. The players like and respect him and NOBODY is more meticulous about preparation. The bigger problem Team Europe has is finding captain spots for all the qualified players. I suspect they all want the role when the matches are played in Europe where the home team is virtually unbeatable. Westwood has indicated he wants the job in 2022 when the Ryder Cup goes to Italy, which means Garcia might get the nod for 2024 in the U.S. He’ll be 44. Somehow Europe also has to work some or all of Justin Rose, Luke Donald, Paul Casey, Ian Poulter, Graeme McDowell and Henrik Stenson into the mix too. They’re all in their 40’s now. There’s been a lot of discussion lately about the high price of golf equipment, with drivers routinely topping $500 and iron sets well above $1000; and no definitive proof that this year’s model will be any better than last year’s or the one you bought five years ago. What’s your take on the cost of new golf equipment and it’s impact on the game? Deeks: Way too expensive, and of questionable value, in my opinion, if you’re looking for better results. To be honest, I wish I’d never disposed of my 1970 Ben Hogan irons, with lightweight steel shafts. I never hit the ball better than with those clubs. But, like just about everybody, I succumbed to marketing, and four or five sets of irons later, my handicap has gone up six points, and I can’t remember the last green I hit in regulation. My point is, golf clubs are 99% marketing, and 1% innovation, and by 1%, I mean there may be a true tech advancement once every five years. But it’s amazing what a placebo effect marketing can have on a player… how many times have we heard our friends (or ourselves) say, “Jeez, I LOVE these new clubs! I’m convinced I’m hitting it twenty yards further with these babies!” Uh, I doubt it. But more to the point, how’s your handicap? And was the $500 or $1,000 really well spent? Loughry: I think new equipment pricing has little impact on the game. There’s no rule that says you have to buy the latest and greatest every 6 months. That goes for every sport. There are so many alternatives for equipment in second hand/secondary market with amazing pricing. Just like you don’t have to spend $300 on a green fee, there’s plenty of choice within the market. Ultimately the market dictates what works and doesn’t, and if manufacturers aren’t careful with appropriate pricing for their product there will be a market correction. Schurman: Prices are down compared to the late ’90s when drivers were between $500 to $800.00 and irons were $1200.00 to $1500. No club will help unless it is ‘fitted” by an expert Club Fitter. Of course, you can always get lucky and pick-up a club that works like a charm but with over 40,000 combinations the chances aren’t very good. The technology exists to supply accurate information that actually is beneficial, so why not use it? Kaplan: It’s outrageous! I used to work at Golf Town, where I would spend a sizeable portion of every shift trying out new clubs in the simulators. And the one thing I noticed is that when they were taped up and fitted with stock shafts, there was barely a difference in the results from club to club. You could tell which club was which from the feel of the grip and any other small differentiating characteristic (club head size, markings on the crown, colours of the shaft), but the technology is so similar from brand to brand these days that most purchasing decisions are mostly influenced by advertising efforts and which clubs your favourite players play, which is a terrible way to select the correct club for you! When it comes down to it, the biggest difference between a Ping G400 hybrid and a Wilson Staff C300 hybrid is the amount of money left in your bank account at the end of the day. Rule: I’m not really qualified to answer this question as I’m not much of a tech guy when it comes to golf, I don’t often spend money to get the latest and greatest, perhaps that’s partly due to the price and how much value you get for that high cost. It’s similar to getting the latest iPhone, I’ll never spend $1,000 on the newest phone because it’s not that much better than last year’s model. That’s how I feel about new golf equipment. Every once in a while, a new product will come out that is clearly better than the previous model, but when it comes to drivers and irons, it’s rarely that much of a difference, so I’ll wait until it hits the sales rack after the golf season thanks! But there are obviously those who always have to have the latest and greatest, and all the power to them, keeping the golf companies in business! Quinn: Last fall, I finally convinced the neighbour to upgrade to a driver built in this century. He whimpers every time he takes out his credit card, so it was a challenge. But, I got him fitted with PING demo club at a Golf Town sale and he’s been chirping about the $380 bargain ever since. The driver cost more than the rest of his set but the technology is demonstrated every time he hits it. His swing is still awful, but his drives are great. So, in that sense, in this case, his new equipment is priceless. I’ve seen the massive difference the new technology can make with other players — including my wife and daughter — and myself. Don’t think the yearly upgrade will have a dramatic effect, but if the budget can handle it, an upgrade every 4-5 years would. Mumford: There’s no way that new golfers and beginners should be looking at new equipment until they develop a reasonable facsimile of a swing with any old thing they can get their hands on. The latest and greatest new club technology is aimed at pros and elite amateurs that can take advantage of it, and deep pocketed hackers that still believe they can buy a swing. Fitting has changed the way we perceive technology. If you can’t see a discernible difference with new clubs vs the ones you have now, there’s no reason to change. And more distance isn’t necessarily an answer if you’re just deeper in the woods. Like most things in life, if you really believe it will make your golf game better, then no price is too expensive. Otherwise, take some lessons. 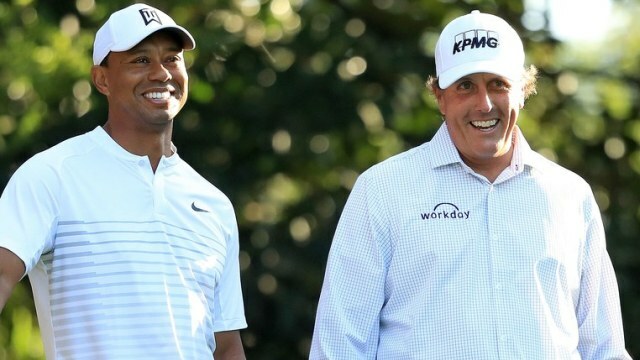 A recent anonymous poll of European Tour players by Golf Magazine, reported that 79% would rather have dinner with Tiger Woods as opposed to 9% with Phil Mickelson. Which player would you choose or is there another player you would prefer to dine with? Deeks: Given the choice between the two, I’d probably take Tiger, too. Although I suspect dinner would take place at Perkins, and Tiger would be chatting with the waitress more than me. Personally, the golfer I’d most like to have a one-on-one dinner with is Lee Trevino, provided he’s in a good mood. I think you’d just say “hi” and then let him talk for two hours. But you’d leave with a master’s degree in Golf, and sides splitting from laughing so hard. Loughry: If we’re talking ever, then for me its Bobby Jones. Would certainly love to talk to him about his play, but we would spend a lot of time around his vision for Augusta and The Masters. If we’re talking a living player, I’m in the 79% pool, I’d much rather have dinner with TW (although Jack is neck and neck with TW here). I’d just like to see Tiger with no cameras or mics around, just in a comfortable setting so he can let his hair down and be himself. I have no doubt we’d get along just fine. Schurman: This is no surprise to me! I’ve written several articles about this subject. While I am NOT a Tiger fan, I do respect his record. He is a character and does live life to a very full extent. There are plenty of stories about his out-going, joking around attitude and he is also a prankster. I don’t know but I doubt he drinks beer none the less he is reputed to be a lot of fun. Phil is as cold as they come. Everything is about him! Of course, he is proud of his accomplishments but just as Ken Venturi’s father told him “Son if you are as good as you say you are, the people will tell you”. Phil is probably a ‘good’ guy, but he is not a ‘nice’ guy. Kaplan: Tiger has been my golf hero since I was 10, but I don’t think I would want to eat dinner with him even though I have thousands of questions for him. I feel like he’d probably supply very stilted answers to all of my questions and wouldn’t let his personality shine through. Mickelson, on the other hand, seems like a more fun dinner partner. You just know that he’d have countless, hilarious betting stories and would be tipping 100-dollar bills to every busboy in sight a la Jimmy Conway. Rule: That’s not surprising, Tiger was a hero to many touring pros growing up and many of the Euro players haven’t met either one of them yet. I’d much rather have dinner with Tiger than Phil, but still not sure he’d be the most interesting guy with which to share a conversation. If I were to pick one, it would probably be Jack, but if I had to pick a current player, I think it would be Rory. Or maybe Paige Spiranac! Quinn: Definitely in the 9% camp. Not even close. Have always enjoyed Phil’s sense of humour with the media. My favourite line was in response to all the ‘Phat Phil’ headlines and stories about his weight, and after the Masters win his vertical jump limitations. At a press conference, he said: “I’m very fortunate because my fat cells are subcutaneous.” Silence. As Phil had guessed, no one got it. He’d be entertaining company over dinner and some fine wine. Don’t think the other guys would be. And, you know, maybe we could talk about stock tips and gambling. Mumford: Very perceptive of the Europeans! I’d really like to learn what makes Tiger tick and how he channels that to win golf tournaments. There’s not much about Phil that I’m interested in learning, except maybe to ask him what the hell he was thinking when he hit that moving ball at the U.S. Open. Alternatively, dinner with any of the player turned golf course architects like Ben Crenshaw, Geoff Ogilvy, Jack Nicklaus, Greg Norman or Tom Weiskopf would be fascinating.